Initiations Committee Open House - September 21, 2014 ~ The Toronto Hare Krishna Temple! Here at ISKCON Toronto, an Initiations Committee consisting of Sita Thakurani devi dasi, Rupanuga das, Jagannath Misra das and Shyama Mohini devi dasi and has been put in place with the mandate to develop and manage a mentorship system. This system will facilitate and nurture interested devotees aspiring for first and second initiation. The information on initiation standards and procedures will be available here shortly (a dummy link with our documents). The Initiations Committee has also developed an initiations policy to help aspiring candidates prepare themselves better to seek initiation from an ISKCON guru. We hope you will find it informative and fair. 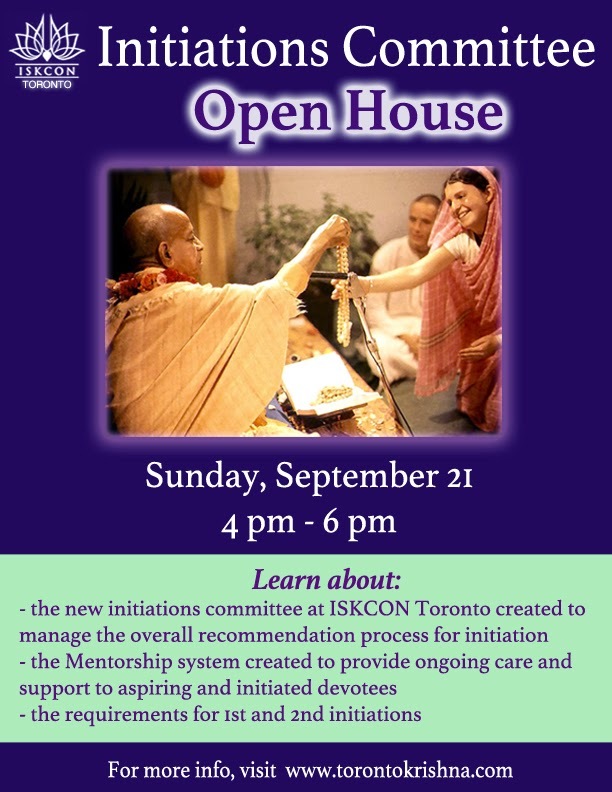 Based on the above-mentioned information and your enthusiasm to continue to serve ISKCON, you are humbly invited to attend an information session on Sunday, September 21, 2014 from 4:00 - 6:00 PM at Govinda’s for further details on the Mentorship System including the process of seeking formal initiation at ISKCON Toronto. To help us plan better, please register and RSVP for this informative seminar by clicking here.